The Chitradurga range became activated today with the bomb dropping trails from LCA Tejas. Consequent to operationalisation of Bangalore International Airport (BIA), Air-to-ground range at Kolar was deactivated, as it was coming in the traffic path of the BIA. 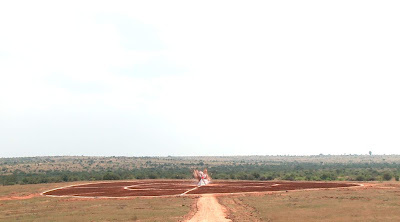 Accordingly, the Karnataka state government had allocated suitable land at Chellakere near Chitradurga to set-up a full-fledged Aeronautical Test Range (ATR), for use by all the aeronautical system developers in the country. While work is going on to set-up the facility under the guidance of Aeronautical Development Establishment (ADE), National Flight Test Centre (NFTC), ADA, took the initiative to activate the air-to-ground range for the ongoing air-to-ground weapon and drop tank jettison trials of Tejas, the indigenous Light Combat Aircraft. 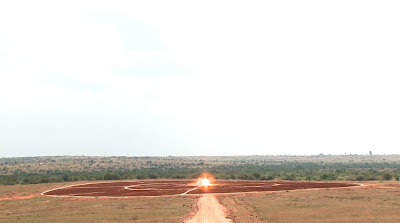 “Thus, the Chellakere DRDO Test Range became operational with the first ever bomb testing experiments of LCA, though the total infrastructure and other logistic facilities are yet to be completed while the financial support is also in full form is awaited. With this back ground, this facility has reached a new height by carrying out the experiments of LCA” said Dr Prahlada the Chief Controller - DRDO. He opined that this successful tests conducted today also signifies a major milestone in the field of aeronautical developments in the country which is of a proud moment for the entire scientific community. Other than LCA tests, this facility will also be used for various tests of UAV flights and electronic warfare systems in the days to come. Shri PS Subramanyam, Programme Director (CA) & Director, ADA said that on December 15, 2010, Tejas PV-2 aircraft piloted by Gp Capt (Retd) RR Tyagi dropped practice bombs on the target. Thus NFTC, ADA became the first to use the facility for weapon testing on Tejas. For this purpose, air-to-ground target and Range Safety Officer (RSO) bunkers were constructed at the range site. NFTC mobile telemetry with Test Director and critical system monitoring personnel were also positioned at the test range. The mobile telemetry was linked to the base station Bangalore, through BSNL fiber optic link to monitor the test aircraft data and video in real-time. Availability of the range at a reasonable distance from Bangalore is expected to have a beneficial effect on clearance to air-to-ground weapon, integrated with various sensors onboard Tejas. The activation of air-to-ground range at Chitradurga built and operated by NFTC, ADA was made possible with the active support and assistance from the local authorities, Deputy Commissioner Amlan Aditya Biswas, IAS and Superintendent of Police, Labhu Ram, IPS.